Not taking too kindly to being usurped in the graphics card performance stakes by the AMD Radeon R9 290X, Nvidia has just fought back with the GeForce GTX 780 Ti, which, by our reckoning, takes back the single-GPU crown that had previously belonged to the GeForce GTX Titan since February of this year. Composed of an entire GK110 die - 2,880 shaders humming along in tandem - the GTX 780 Ti is the pinnacle of Kepler engineering. Nvidia's partners have naturally been keen to take advantage of this GPU with custom-cooled, pre-overclocked efforts of their own, and just over a week after the reference card's launch, we have Gigabyte stepping up to the plate with its OC model. Gigabyte has spent time and effort into producing a cooling design that can take care of top-end GPUs with ease. 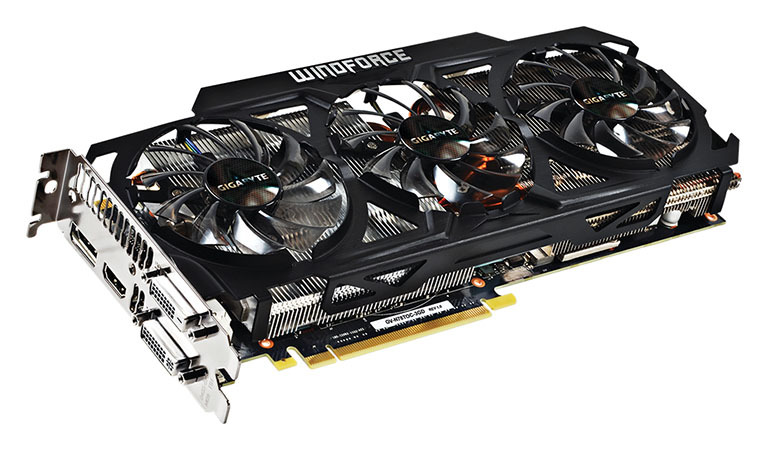 Dubbed the WindForce 3X and, Gigabyte says, capable of dissipating a colossal 450W of heat, it already cools the GTX 770, GTX 780 and Titan cards. There's little reason to reinvent what works well when considering the GTX 780 Ti, which, if you remember, has the same TDP as other high-end Nvidia GPUs. The card looks impressive, and we already know the triple-fan cooler works well from our time with the GTX 770 variant, but it doesn't quite provide the luxurious feel you get from Nvidia's reference design. The stock cooler is, in our estimation, sexier and more appealing on the basis of it using an exhaust mechanism as opposed to an open-air design. This new WindForce cooler feels sturdier and better-built than the plastic variant we saw last year. Gigabyte has enough faith in it to increase the minimum/peak core speeds from the reference 876/928MHz to a lofty 1,020/1,085MHz, representing a possible 17 per cent gain: heady stuff indeed. While there's a marked increase in the core speed, memory frequencies, however, are kept at 7,000MHz, which may hinder the firm's efforts in getting out the fastest partner-clocked card on the market. What we can say, with a fair degree of certainty, is the core overclock will enable this OC to be the fastest single-GPU card we've ever tested, and our sample consistently boosted to 1,120MHz in every game. Outputs match the reference card's DVI-D, DVI-I, DisplayPort and HDMI. A small vent facilitates hot air being pushed out of the back, but with an open-air design such as this we found that most of it escaped back into the chassis. Gigabyte includes no games in the bundle, though Nvidia provides a helping hand by throwing in a bunch of decent titles if the card is purchased from an authorised retailer. The cheapest GTX 780 Ti cards retail for around £550, so it would be reasonable to assume that, when available, this custom-cooled OC model, backed by a two-year warranty, will cost closer to £600. Pricing is always a thorny subject when discussing ultra-enthusiast graphics cards - one usually fields questions of 'I can buy an entire PC for that.' Have a look at the benchmarks before taking a perceived value into account.